I was unable to resist purchasing Romantic Hand Knits: 26 Flirtatious Designs That Flatter Your Figure by Annie Modesitt. Shortly after I was in the vicinity of a yarn shop and had to go in to buy some stuff for a swap package. The yarn shop kindly allowed me access to a copy of the book so I could make yarn purchases for myself. And it happened. I saw this yarn that I immediately scooped up and hugged. 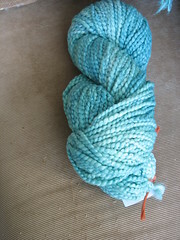 It was Farmhouse Yarns I am Allergic to Wool, and it is a cotton rayon super bulky yarn. It isn't cheap but it's so pretty and snuggly feeling. It's 150 yards in that skein to give you a sense of how truly bulky it is. I have done something clever with the tag, so I have no idea what the official color was, and the ones on the website all look more blue than turquoise to me. But I love every bit of the color. I took the Gigi pattern from the book, although since it is knit with a much skinnier yarn, I modified it for one pattern repeat. I knit it on 10.5's (the options needles). I also decided it would be nice to make a hooded scarf, so when the scarf went from fingertips to my shoulder, I started increasing (twice on each row) until I had enough for a second pattern repeat. This is how far one skein got me. 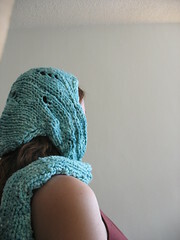 So then, when the hood part made it around my head I started decreasing (twice on every row. I really like this stitch pattern, it follows a fairly simple numerical pattern that was easy to remember and just eyeball, which made it a fairly portable project. 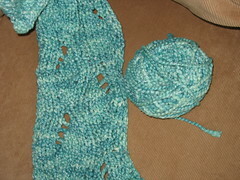 And this yarn is so bulky, progress was visible pretty quickly. 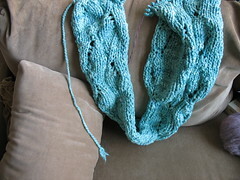 Here is a closeup on the pattern and how much yarn i had left over. And here is it what it looks like on. Yarn: Farmhouse Yarns I Am Allergic to Wool - 1.5 skeins.